For example, let’s say we chose to create a futures wheel from the provocative statement, ”By 2010, we talk to our computers, they talk back, and recognize us via biometrics.” This statement is a vivid way of expressing several related trends: 1) increasing multiplicity of input and display devices for computers, with consequent decline in use of keyboards; and 2) increasing use of “biometrics” – identifiers based on unique characteristics of living organisms, like our fingerprints, retinal patterns, blood type, or DNA. market emerges for ”great voice” modules to personalize computer speech. These are just a few examples of primary effects these changes would have in our immediate lives. 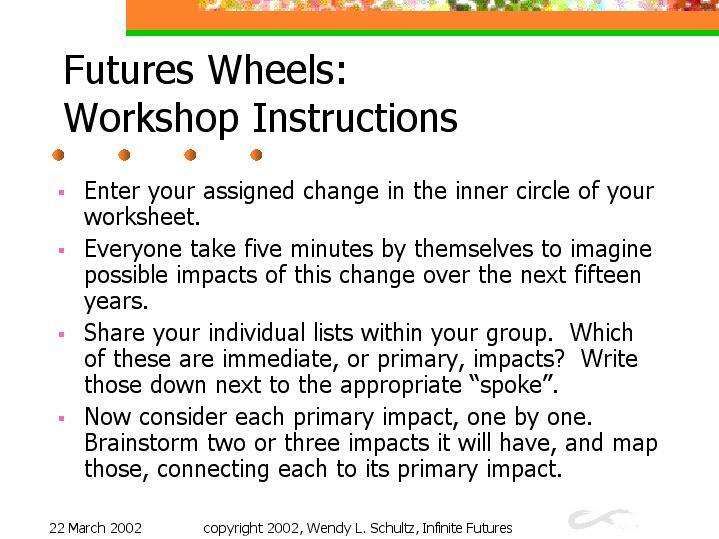 If your thinking gets stuck, look at the subdivisions in the futures wheel. These effects address the areas of work, education, daily life, health, and the economy – what about hobbies? our homes and family life? the arts? etc. people in the same room conversing through their computers’ wireless network. While listing the secondary effects of the chosen primary effect, tertiary effects also emerged, as the indented, italicized items illustrate.